Josette here with another card creation. I love snowmen, they are right at the top of my list. Whenever I see a snowman image or stamp, I need it. Needless to say, I have more snowman images than flower images, and that is saying a lot. 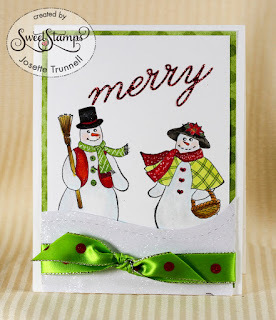 For this card I used Snowman Duo from the Sweet Stamp collection,. They were colored twith Copic Markers and embellished with glitter. Cute. This is an A-2 Card. Using Black Momento ink they were stamped onto a white card base. Colored and then embellished with a bit of Wink of Stella-Clear. This was cut down to 3.75 " X 5". A mat was cut from a green paper that matched the clothing and measures 4" X 5.25 inches. They were adhered without any dimension. The snow bank was cut from a piece of thin card stock that had been covered with score tape. Glitz glitter was burnished into the adhesive. Actually the glitter was added prior to cutting. Merry was created the same way using red glitter and score tape. The last step was adding a ribbon. Sweet and flat enough for mailing. All products used in this card are available at http://sweetstamps.com or the Old site for Sweet Stamps. (They are transitioning everything to the first location, but a few items remain at the other location. Adorable snowmen! Fun card design and love the polka dot bow! Beautiful coloring on Mr and Mrs Snow, I love the colors you chose and the ribbon on the snow.